Glenmorangie Quinta Ruban is a velvety-textured single malt whisky, for confident, colourful, dynamic luxury spirit drinkers who like to take the lead. 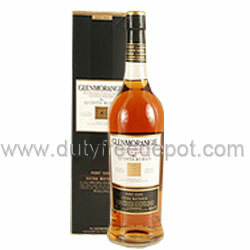 A mature Glenmorangie that is transferred from the original ex-bourbon cask and then extra matured in port pipes, shipped from the Quintas or wine estates of Portugal. Maturation in the ruby port pipes develops The Quinta Ruban into a voluptuously smooth spirit with a complex balance of sweet and dry flavours that engage the entire palate and envelope it in an intriguing balance of smooth velvet and crisp, cooling textures. Non chill-filtered and with an ABV of 46%, its key flavor notes are rich, chocolate and mint.